Becoming windy with thunderstorms likely. Rainfall will be heavy at times. High near 65F. WNW winds at 5 to 10 mph, increasing to 20 to 30 mph. Chance of rain 80%. 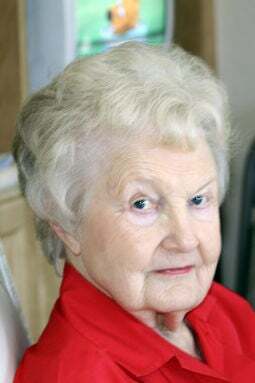 Higher wind gusts possible..
Fern M. Olson, age 93, passed away Thursday, Jan. 31, 2019, at Methodist Fremont Health. Fern was born Nov. 2, 1925, to Lillie (Seberg) and J. Howard Peterson in Oakland, Nebraska. She attended Oakland High School and graduated in 1943. After graduation Fern worked on the family farm until she married Dale. Fern married Dale in Oakland on June 29, 1949 and, soon after, moved to Fremont where Fern was a wife and mother. Fern loved her roles as wife, mother, grandmother and friend to many ... and she excelled in them all. She cared for Dale and Nancy well, and was quite the mother-in-law to Mic and “Nana” to Alec, Sam and Lillie. She also was a mother to their two AFS exchange daughters ... Fiona from Rugby, England, and Celia from Sydney, Australia. She loved all of her friends, whether from church, bridge, the neighborhood or the new ones she met at the grocery store!!! Survived by her husband, Dale; daughter, Nancy (Michael) Johnston of Omaha; grandchildren, Alec, Sam, and Lillie Johnston of Omaha; niece, Marie (John) Burnham and family; and nephew, Dr. Jeff Peterson; exchange daughters, Fiona Wall and Celia Harper. Visitation is 4-8 p.m. Thursday, Feb. 7, at Dugan Funeral Chapel. The funeral service is 10:30 a.m. Friday, Feb. 8, at First United Methodist Church. Pastors Bill Gepford and Scott Jensen will officiate. Burial will be in Ridge Cemetery, Fremont.